Fleet managers take note – the opportunity to attend North America's largest work truck event is just a short drive away next week when The Work Truck Show 2018 pulls in to Indianapolis. The event will provide fleet managers and others in the vocational truck industry with cutting-edge information around improving fleet productivity, capitalizing on the vehicle technology revolution and implementing fleet best practices, while offering an unbeatable opportunity to compare products from 500 exhibiting companies. The Work Truck Show is scheduled March 6–9 (exhibit hall is open March 7–9), kicking off with a full day of education and networking. 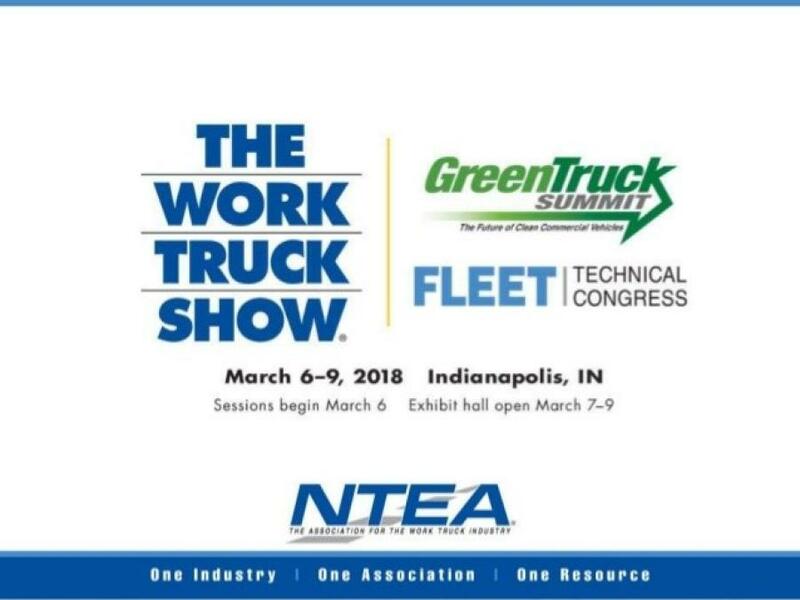 Fleet Technical Congress and Green Truck Summit each run all day March 6, with concurrent educational sessions, including five of the 15 exclusive OEM truck updates, taking place Tuesday afternoon. The opening reception that evening brings together professionals from across the industry to build stronger business relationships. Fleet Technical Congress is a training conference designed to address timely issues affecting the vocational fleet community, providing expert strategy and insight to help fleet managers optimize their resources and navigate operational challenges. The conference kicks off with welcome remarks at 8:30 a.m., followed by the keynote address March 6 at 8:45 a.m. on "The Future of Commercial Vehicles" delivered by Ed Peper, U.S. vice president of General Motors Fleet. Peper will discuss how rapid changes in product development are driving innovation in commercial vehicles and changing working relationships between chassis OEMs and fleet managers. General session topics will follow about the future of commercial vehicles; reactive vs. predictive maintenance; the impact of smart, connected vehicles; how to integrate multiple data streams to enhance decision-making; benefits and risks associated with vehicle data; and techniques for improving equipment replacement strategies. The sold-out Fleet Technical Congress includes access to an additional 48 concurrent sessions Wednesday and Thursday on topics such as truck specifications development, fleet productivity, risk mitigation, emissions reduction and alternative fuels, OEM chassis updates and workforce development. Contact NTEA (800-441-6832 or registrar@ntea.com) to be placed on a waiting list for Fleet Technical Congress registration. Taking place during Work Truck Week, the annual Green Truck Summit is designed for fleet managers, truck equipment distributors, upfitters and truck dealers from around the world, providing current insights and forecasts around the latest productivity options and alternative fuel and technology implementation. This year's keynote address will be delivered by Kary Schaefer, general manager of marketing and strategy for Daimler Trucks North America's Freightliner Trucks and Detroit brands, and discuss available new trucking technologies and ongoing developments in clean diesel, natural gas and electrification. Green Truck Summit general sessions on March 6 will address key topics such as government, fleet and supplier perspectives on future work truck productivity; technology and fuel advancements and what's next for fleets; insights and opportunities for commercial vehicle productivity and efficiency; and strategies for obtaining advanced technology approval and selecting alternative fuels. New this year, all Work Truck Show educational sessions will qualify for International Association for Continuing Education and Training (IACET) continuing education units (CEUs). NTEA was recently awarded Accredited Provider status with IACET, signifying adherence to the ANSI/IACET 1-2013 Standard addressing the design, development, administration and evaluation of its programs to ensure excellence in all education and training offerings. The Show will also feature the debut of new vehicles from Chevrolet Commercial Vehicles, Ford Commercial Vehicles, Hino Trucks and International Truck. Additionally, Ram Commercial, Nissan Commercial Vehicles and Mack Trucks Inc. have scheduled press conferences to announce work-truck-related news and are among the more than 100 exhibiting companies with plans to introduce commercial vehicles and equipment during the event. The Work Truck Show exhibit hall will be open March 7–9. It features 500 exhibitors, including the Productivity and Fuels Pavilion, which showcases companies displaying clean technologies and fuel utilization reduction solutions. Additionally, attendees can experience the industry's latest clean vehicle solutions and alternative fuel applications at the Ride-and-Drive, held March 7–8. Participation is free and available on a first-come, first-served basis to all registered Work Truck Show 2018 attendees. For the complete schedule, educational session descriptions, exhibit floor plan and to register, visit worktruckshow.com. For more information, call 800-441-6832 or email info@ntea.com. Established in 1964, NTEA – The Association for the Work Truck Industry, represents approximately 2,000 companies that manufacture, distribute, install, sell and repair commercial trucks, truck bodies, truck equipment, trailers and accessories. Buyers of work trucks and the major commercial truck chassis manufacturers also belong to the Association. NTEA provides in-depth technical information, education, and member programs and services, and produces The Work Truck Show. The Association maintains its administrative headquarters in suburban Detroit and government relations offices in Washington, DC, and Ottawa, Ontario.